An early example of a low air draft coaster, built in 1981, was seen arriving on Thursday morning. Built as ELDOR, she is a product of the Sietas shipyard at Neuenfelde and was originally German owned. 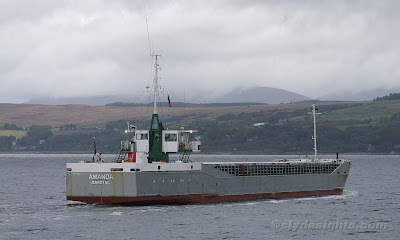 In 2002, she was renamed AMANDA when she was sold to Danish owners. She is 80.94 metres in length, and has a deadweight of 1,795 tonnes. Arriving from Liverpool, she was heading upriver to Glasgow to load a cargo for Islay.